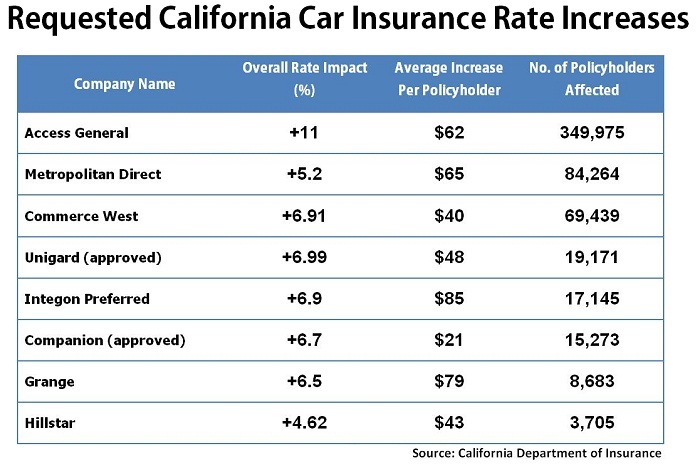 Filings made public by the California Department of Insurance show at least eight car insurers in the state are asking for rate increases, with two of the requests already approved. The biggest average percentage increase in rates belongs to Access General, which has requested an 11 percent increase that would impact almost 350,000 customers. The insurer requests that the new rates go into effect May 28 for new policies and June 30 for renewing policies. Integon Preferred, Unigard and Commerce West all requested rate increases of 6.9 percent. Unigard’s 6.9 percent increase has already been approved and has been impacting 19,171 customers since March. Commerce West’s hike affects its Stonewood Valu Program, and the size of the overall increase is largely due to a requested 19.7 percent hike in property damage coverage. Integon Preferred requested a total 6.9 percent change to rates that would affect 17,145 customers. The company’s last rate revision was a 0.05 percent decrease to rates in June 2010. Metropolitan Direct Property and Casualty is asking for a 5.2 percent jump in rates that would impact 84,264 customers and go into effect Aug. 15. The company’s last rate revision was a 1.1 percent hike in February. Companion Property & Casualty has instituted a 6.7 percent increase in rates for 15,273 customers of its CPCIC personal auto program that began writing policies in June 2011. The company also reported a 5 percent base rate increase to collision coverage. Hillstar’s requested 4.6 percent increase to rates would go into effect May 20 for all policies in its Choice rating plan that gives discounts to policyholders with good driving records. Grange has asked to hike rates by an average of 6.5 percent for 8,683 customers that would be effective July 15. The last revision was a 10.6 decrease in rates in August 2007. Consumers can use websites of state regulators like the California Department of Insurance to research the latest filings of rate changes so they can make an informed car insurance comparison between insurers.